Whispering Oaks Cottage: Feeling the Need for Spring! Feeling the Need for Spring! Feeling a little antsy and craving the outside was the inspiration behind the decor of my mantle in my family room...hmmmm...looks like I have summer more in mind! Yes! I love the seashells and pine cones too. Reminds my of the UP in Michigan....Your mantel looks wonderful! Oh, I fele the same way! Where is spring? Thanks for brightening up with the great eye candy! Love the cones and shells. Your mantel looks just fabulous....where does every one get their sea shells? They are HARD to find out here in West Texas...haha. Guess some of the stores might have some. I would like to fill a pretty jar with a few for my bathroom. We are SOOOOO far away from a beach, I am afraid shells would look out of place here. Your's looks so pretty! after the snowfaal we just got,boy am I ever ready for spring! Purty mantle, Ruth. You did a good job! I'm ready for spring. I want to open the windows and air out my stale house. Then move out all the furniture and hose it down!! Maybe a little extreme spring cleaning but it would do the job! What a beautiful arrangement, Ruth! Love the picture, too -- how you can see the rest of the room in the mirror. I love shells and pinecones, too. They are little works of art..
Did you make it OK through the wind and rain? We were lucky -- no loss of power, and only a little water in the cellar. That looks so beautiful! I love those yellow walls too! OH I'm just dying for sweet fresh spring air!!!!!! Beautiful mantle. Dont' you love this time of year. I know what you mean about being so ready for spring, and I have filled that longing by updating my Charm & Grace main website with all things spring. There are many spring-y photos there that you might enjoy. I love your blog and read it daily. 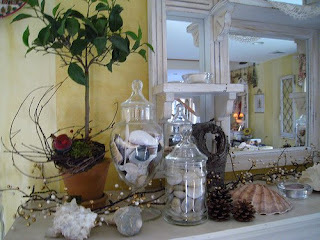 Gorgeous display on that mantle...you are inspiring me, I have a bag full of sea glass frmo last summer...where is it?? I'm going to take a look around and put it in something pretty! Thanks! Beautiful display and I love the blending of shells and pinecones in the jars. Beautiful mirror! An inspiration for spring. Just wanted to say hello and wondering how you're doing! Have a good week. I love that look. Thanks for sharing. Oh, so pretty. Thanks so much for sharing. Nice to meet you. Nothing is prettier than a vignette with natural things...shells, pine cones, rocks...and you have used them all is such a lovely manner! Spring is almost here!! I hope! Oh, thank you for your suggestion on what to use on my breakfast room windows. Red and white/black and white and trim sounds fabulous. Just wanted to wish you Happy Spring and Happy Easter!!!!! Thanks for stopping by! Hope you have a wonderful Easter!! Wishing you and your family a very happy Easter, Ruth! Gorgeous mantel! I love what I have seen of your home from that pic! You have stripes too! My living room is much lighter...but is big stripes of ivory in flat and glossy paint. I have enjoyed reading your blog so much! The pictures are lovely too! Not sure how I found you, glad I did though! Wishing you and yours a blessed Easter Sunday! Great insight. I NEVER would have put shells and Pine cones together but it JIVES doesn't it? If only I had a mantle, I would copy you! oh, holly...i so hope you haven't quit us so soon. you are doing such a lovely job on your blog...it takes awhile to get "in the swing" of things but it will come easier as you go. Your summery mantel is BEAUTIFUL!